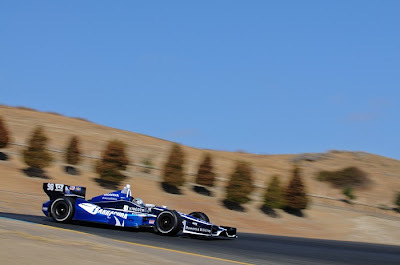 The third to last event on the 2012 IZOD INDYCAR Series calendar, the Sonoma region of California hosted a 85-lap contest of turbocharged, open wheel racing during a pivotal time in the rapidly passing season. 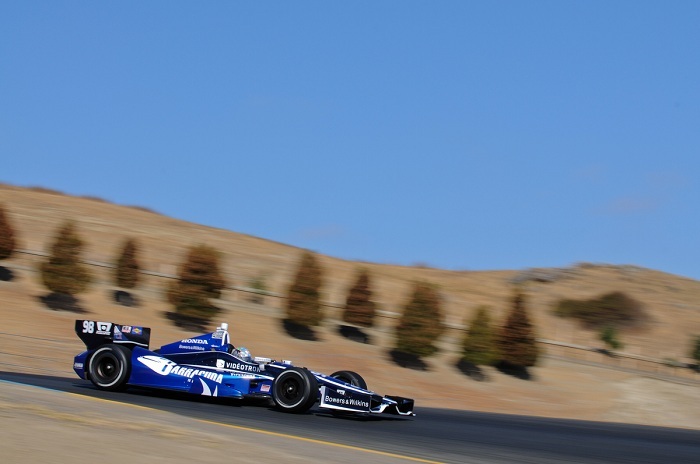 Retuning to action after a three-week hiatus, the IZOD INDYCAR Series drivers and teams entered the GoPro Grand Prix of Sonoma knowing they’re proceeding into the homestretch of their 2012 season. Drivers Will Power, Ryan Hunter-Reay, Helio Castroneves, and Scott Dixon approached the hilly 2.385-mile California road course with the knowledge that you miscue could desperately impact their chance of hoisting the overall IZOD INDYCAR Series championship trophy. Taking his fourth pole in the 2012 season, Australian Will Power placed his Chevrolet-powered #12 Team Penske car at the front of an event he had won the previous two years. A 1-2 start of Team Penske cars with Power’s teammate Ryan Briscoe claiming the second-fastest time in qualifying, the third Roger Penske-owned machine piloted by Helio Castroneves would gain unfavourable attention once the green flag dropped. Starting 4th, Castroneves made contact with championship rival Scott Dixon’s #9 Target Chip Ganassi Racing car in the turn 7 area of the Sonoma racetrack. Contact that amounted to Dixon spinning on-track losing ground to the lead of the field early, the #3 car of Helio Castroneves would himself be plucked from the front of the GoPro Grand Prix of Sonoma when the IZOD INDYCAR Series assessed the Brazilian driver a penalty. Serving a drive-through penalty in the pit lane, Castroneves would make his way back through the race field to 6th place at the end of 85 laps. With the first 65 laps of the GoPro Grand Prix of Sonoma passing without a single yellow flag, the Team Penske race cars of Will Power and Ryan Briscoe were supreme to the rest of the IZOD INDYCAR contenders. Will Power was in control for much of the event reflected in a 8.44-second lead he had on teammate Briscoe on lap 50. Contrasting the fortune of the Team Penske organization, the other IZOD INDYCAR superteam of Andretti Autosport suffered bad luck for 2 of its 3 entries. Canadian James Hinchcliffe retired from the GoPro Grand Prix of Sonoma on lap 35 due to an engine problem. Hinchcliffe’s exit in the #27 car would be followed 11 laps later by Marco Andretti. Only Andretti Autosport car left was the championship-contending driver Ryan Hunter-Reay. The GoPro Grand Prix of Sonoma’s first caution would be the result of a scary collision in turn 8 section of the road course. Colliding entering the corner, the #7 of Sebastien Bourdais and he #67 driven by Josef Newgarden sailed into an outer retaining wall. Despite a severe impact with the concrete wall, both drivers escaped major injury. However, it was determined after the race that Josef Newgarden did suffer an injury to his left index finger. His Sarah Fisher Hartman Racing team opted to place Bruno Junqueira for the upcoming Labour day weekend street course race in Baltimore. As the field operated under its first full-course caution, this incident would be defining for the event. Two laps prior to the Bourdais/Newgarden accident, the leader Will Power had pitted relinquishing the lead to the #2 car of teammate Ryan Briscoe. Restarting on lap 74, the late laps of the GoPro Grand Prix of Sonoma would claim other championship-contending driver when an overly ambitious move performed by Alex Tagliani led to contact with the #28 car of Ryan Hunter-Reay. INDYCAR race control penalized the Canadian driver Tagliani but Hunter-Reay lost a potential top-5 finishing a disappointing 18th place with only two races remaining to compete for the series’ overall championship. 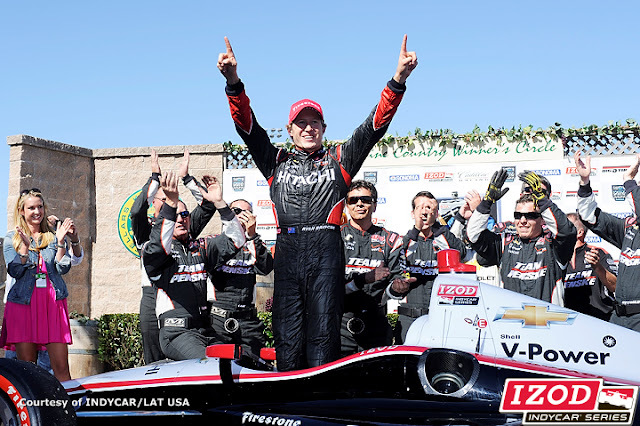 With his newfound advantage over teammate Will Power, Ryan Briscoe soared away on the race’s final restart at Sonoma winning his first IZOD INDYCAR race since the 2010 race at Texas Motor speedway. As the 2012 had been reaching an end, Briscoe’s presence with Team Penske for 2013 and beyond has been much questioned. With the victory in the GoPro Grand Prix of Sonoma, the Australian driver Ryan Briscoe has allowed Team Penske to have all three drivers in the 2012 winner’s circle. 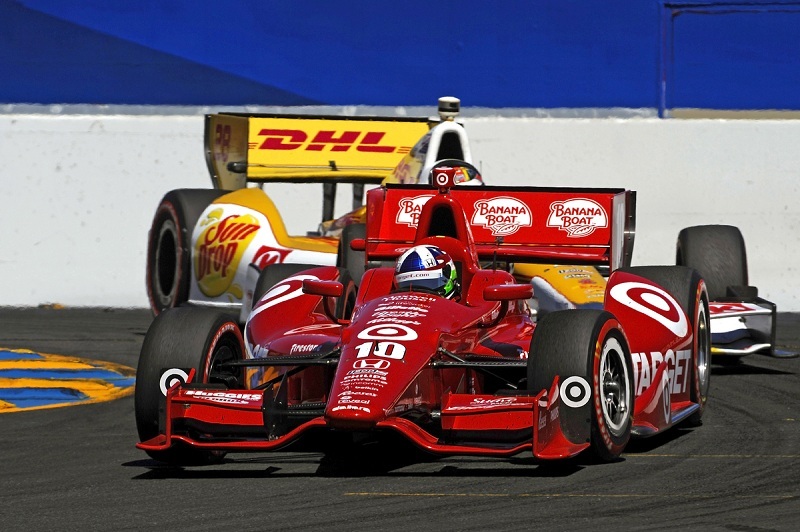 Chevrolet-powered contenders in the IZOD INDYCAR Series led every lap in the GoPro Grand Prix of Sonoma acting as additional garnish to locking up the engine manufacturer championship for 2012. A season where the Bowtie brand has won 9 of the 13 races so far in the 2012 IZOD INDYCAR Series, Chevrolet’s battle against tour mainstay Honda and the limited resources of Lotus is a triumphant return to a series they were absent from since the end of 2005. Chevrolet’s open wheel racing is made possible with a twin-turbocharged, 2.2 liter V-6 engine the auto company says reflects the technology currently being implemented in production cars for the street. Next race for the 2012 IZOD INDYCAR Series is a Labour Day weekend Sunday race on the streets of Baltimore.